We employ the use of a bucket truck when needed on a job. We use it to both prune trees and to remove trees. A bucket truck enables us to reach areas of a tree more quickly, efficiently, and safely. Our operators are skilled in the use of this equipment. 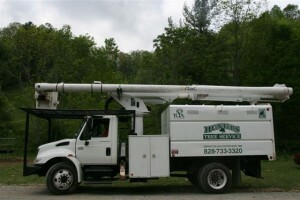 We provide bucket truck service throughout the High Country. When we provide you with an estimate for your job, we can let you know if the use of a bucket truck would be useful. Safety is very important to us, and we maintain the highest standards of safety regarding our staff and operation of all equipment. We make sure that everyone is well advised during a job that requires the use of a bucket truck. Find out more about our company, Hunter’s Tree Service, Inc., and the services we provide by contacting us today. We do both residential and commercial work throughout the High Country. We would be happy to help you with tree pruning, view enhancement, tree removal, stump grinding, bucket truck service, crane service, lightning protection, tree cabling, pre-construction consultation, and fertilization and pest control. Contact us today and tell us how we can be of service to you!